Elephants are said to have memories, well, like an elephant’s… In nature, elephants live to 70 years of age. Their family structures are sort of like tribes. Unless interrupted by humans, they live together in family groups all of their lives. 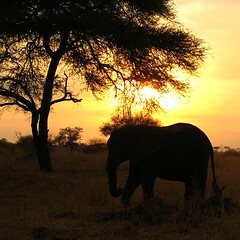 When an elephant dies, its family members engage in intense mourning and burial rituals, conducting weeklong vigils over the body, carefully covering it with earth and brush, revisiting the bones for years afterward, caressing the bones with their trunks, often taking turns rubbing their trunks along the teeth of a skull’s lower jaw, the way living elephants do in greeting. There is something of the intimations of eternity in the actions of the oldest and wisest animals on the plant. They know love, loss, and a memory of the generations that have gone before. They share an appreciation of their young. Legend has it that elephants near death separate from their companions and trek alone to ancestral graveyards, dying only when they reach this special place, called a boneyard. My grandparents only died in the past 15 years. My parents are just starting to approach their 80’s and are showing signs of age. I have found that losing those you love makes it somewhat easier to look forward to the time of your own end, with the hope of seeing those you love once again. Most of you don’t have grandchildren yet… Leigh and I have two now. We, like elephants, are starting to appreciate the transition of the ages. Children are a blessing, but grandchildren are a wonder. To be called Grandpa makes you start to see yourself as part of the generations gone before you. A link to the past with a link to the present and a link to the future. I remember seeing the alumni coming back to Landon when we were there, and thinking, “Who are these old farts?” Those ancient alumni were probably all of 25, 30 or 35 years of age at most. Wow, how your perspective changes! There is something in the memory of youth that makes us want to return here… memories that are still living in our mind’s eye and not dead. Times of play and joy, easier times, lesser responsibilities, when we all believed in the illusion of our own immortality. Friendships, like a tribe, have lasted a lifetime. When we meet up, it is as if all the years between have disappeared and we are back to our youth. There is something here we have shared, we shared with no one else. But there is also something in our memories, which speak to our hope for eternity. It is a memory almost forgotten… buried under leaves and grass… that life goes on even after the parting of familiar friends. This is our 40th, and it is hard to believe that many years have passed. The 45th and the 50th lie ahead. The circle may yet be unbroken, God willing, but there will come a time when our visits to the Boneyard will cause us to raise our glasses not just to the prior generations, but to the memories of our own. May the Lord keep us all safe until we gather again.